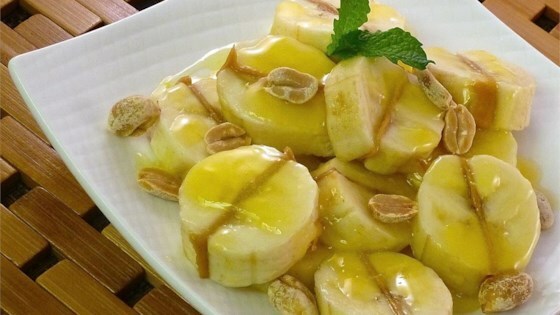 "A neighbor introduced me to this southern sweet and sour banana dish. It was quite a hit. I made a couple of improvements (to my tastebuds) and thought I should share it." Spread peanut butter onto the cut side of the banana halves, and seal the halves back together. Slice into coins, and set aside. In a saucepan over low heat, whisk together the egg yolks and 1/2 cup of the sugar. Stir in the vinegar and butter. Cook, whisking constantly until clear. Whisk in remaining sugar if you like. Place the bananas into a serving bowl, and pour the sauce over them. This dish may be served hot or cold. It wasn't quite what i expected. The vinigar was extremely strong. Maybe if there wasn't so much vinigar it would be good. Still it was very interesting. It may sound weird, but it really tastes good! My whole family loves it. It is a great side dish to those casseroles that have "everything" in them! I highly recommend it!